No-one should have to make room in their lives for a junk automobile. The only place for an old and broken down vehicle is in the salvage yard getting wrecked. And in Brisbane, the best place that does this best is here at QLD Wreckers. We pay only the best prices for scrap cars, and the whole deal is over within the same day. This is the fastest and most convenient way to sell a car, period. We provide price quotes for free and with no obligations attached. Our removal equipment is top of the line. The Junk Auto Removal Service we provide is completely free, with no hidden costs. The staff that work here are highly skilled and very helpful. All the paperwork is completed for you, and all you have to do is sign. Recycling Vehicle metals for the good of the environment. The most accurate appraisals available for used, old and junk automobiles. We buy cars, no matter what condition they happen to be in. The most cash you can get for your car is what we will pay, up to $9’999. The day of removal we pay you cash on the spot instantaneously with no fuss or hassle. We Buy all makes and models in any condition including junk, scrap, non-running, non-registered, unwanted, totalled, broken and fire or water damaged. The broken car collection process is absolutely vital for our environment. 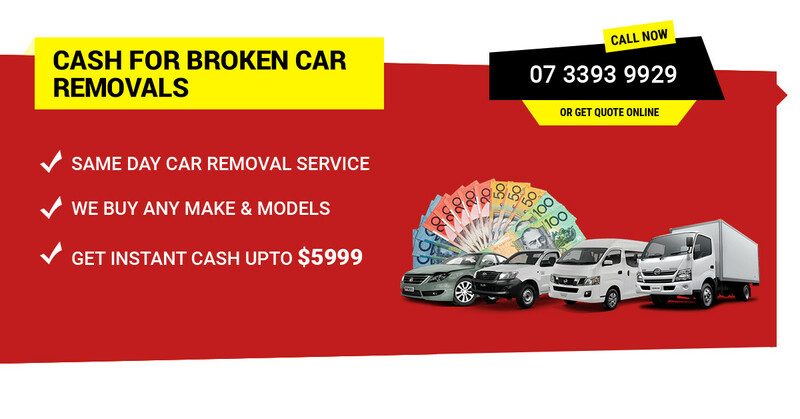 How about if you get the unwanted car removal service Free of cost in Brisbane or an immediate suburbs? Qld Wreckers can make this happen for you. Keep in mind that it is an offense to leave an abandoned vehicle on Brisbane roads. How the Broken Car Selling Process Works? Wondering, how to sell my broken car for good money? It may seem like a daunting process to get rid of a broken car. How sorely mistaken, you would be if this was your assumption. But you can make things right by taking the first step and admitting that selling a junk car is easy when selling to us here at QLD Wreckers. Get in touch with us: The number you will want to call is 07 3393 9929. We also have a form on our website https://www.qldwreckers.com.au/ that you can use as an alternative method for contacting us. Tell us all About the Car: Tell us the make, model and age of your car. It is also important for us to know what condition it is in. We then provide you with a free price quote. Arrange a time for us to visit: We will come around and inspect the car. A final offer is given, and if you accept that we pay you before taking the vehicle back to our yards. The removal is free! Don’t waste another moment and get in touch with us to sell your broken car for top cash!